The Chauci were an ancient Germanic tribe living in the low-lying region between the Rivers Ems and Elbe, on both sides of the Weser and ranging as far inland as the upper Weser. 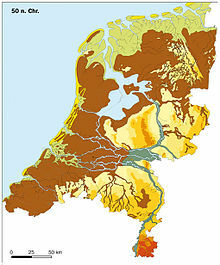 Along the coast they lived on artificial mounds called terpen, built high enough to remain dry during the highest tide. A dense population of Chauci lived further inland, and they are presumed to have lived in a manner similar to the lives of the other Germanic peoples of the region. The Cananefates, or Canninefates, Caninefates, or Canenefatae, meaning "leek masters", were a Germanic tribe, who lived in the Rhine delta, in western Batavia, in the Roman province of Germania Inferior, before and during the Roman conquest. The Batavi was an auxilia palatina (infantry) unit of the Late Roman army, active between the 4th and the 5th century. 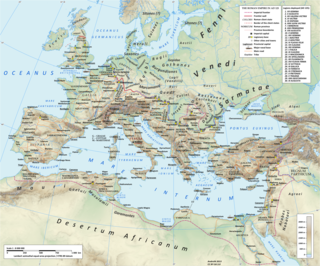 It was composed by 500 soldiers and was the heir of those ethnic groups that were initially used as auxiliary units of the Roman army and later integrated in the Roman Empire after the Constitutio Antoniniana. Their name was derived from the people of the Batavi.